How do you define success? Recently while traveling in west central Minnesota, I have had the opportunity to reconnect with former board members, loan recipients, and grant recipients. These visits have reminded me of why West Central Initiative is here, to be YOUR partner for success. Third-generation local bank ownership. Community partner, employer, leaders in your community. Young entrepreneur, started his business 27 years ago, community leader, employer, company continues to grow and expand its markets. Committed educational institutions to retooling and finding ways to bring workers into the workforce to meet current employer needs. Manufacturing firms committed to training their employees and getting involved in their communities. Young entrepreneur, started her business 25 years ago, expanded business three times, community leader, serving on WCI board of directors. CEO fortune 500 company, community leader, major employer, philanthropist. Local media covering positive events and happenings in their communities. Communities gathering and designing their future based on their assets. And more. The community leaders in west central Minnesota are optimistic about their future. They have learned the value of working together – for all. The tone of the meetings are positive, bright, and full of energy. Rural Minnesota is a great place to live and I’m proud to be a part of the history. My hats are off to all of the dedicated and committed folks who continue to make rural life a reality for future generations. 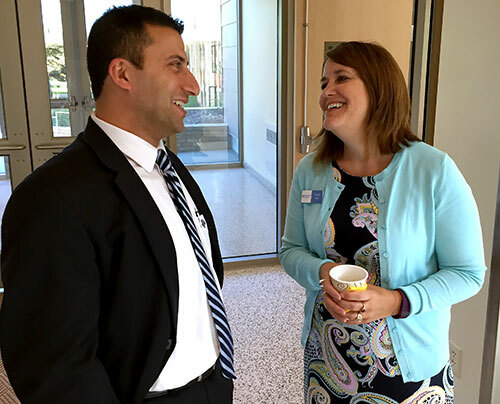 Photo: Sandy King chats with Newzad Brifki, director of the Kurdish Community of America, at a WCI meet and greet in Moorhead.